New York is our next destination to travel soon. We are planning to visit the famous Statue of Liberty and some other popular spots in New York. We are looking forward to visit New York in the future. The Statue of Liberty, formerly known as "Liberty Enlightening the World", was the brainchild of French sculptor Auguste Bartholdi, a gift from France to America. Its construction took hundreds of workers working 7 days a week, 10 hours a day, 9 years to complete in 1884. 350 statue pieces were packed into 214 crates and shipped from France to New York. 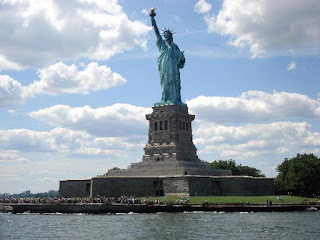 The statue was reconstructed on Bedloe Island, now called Liberty Island, in New York harbor because this was where people would get their first view of the New World as they sailed into the harbor. The statue is a universal symbol of freedom that welcomes all immigrants coming to America.